Not really seeing the coyote there and am wondering just what was *in* that flu medicine. But if there is a coyote, I predict a rapid fall-off in the number of fat possums. I am pretty sure that the little tortoise kitty was Tatsuko coming to say goodbye. Yeah, she's been on my mind all day. I miss her a really lot. Working on building up to making a post about it, but not ready yet. I shall check again on the iPad later - my crappy work monitor washes out all the detail. Another friend lost her kitty last night too - about the same age. It has been a very sad day. I'm giving the boys extra love and cuddles. 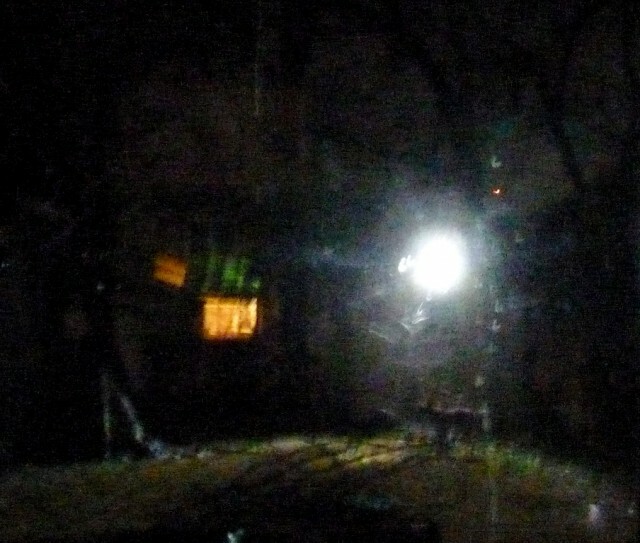 Well, to be fair, the photos are crap: This is a wild animal, after all, and could see me well inside the house even with all the lights out. So this was through a double-pane sliding-glass window from about 40 feet away with the only lighting supplied by a 5-watt spot pointed pretty much directly at the camera. So, yeah. But I wanted some kind of evidence! And they reached New York City some time in the 1990s. I know, right?! I want to get one of those wild-game cameras and set it up to take surprise urban-wildlife photos at night. I bet I'd catch at least a dozen at this rate!